Truvox distribution partner, Cleaning Systems UK of Cupar in Fife has solved a problem for Murray Rolls-Royce in Edinburgh after the refurbishment of the Rolls-Royce showroom floor with cream limestone tiles created cleaning difficulties. “Cleaning the new tiles with a conventional mop just didn’t shift the dirt that gathered in the grouting” explained Brian Dickson, Sales Manager of Murray Rolls-Royce. “A Rolls-Royce showroom must remain pristine and just cannot be allowed to look dirty. So I searched on the internet for somebody to help, and fortunately found Cleaning Systems UK in Cupar”. 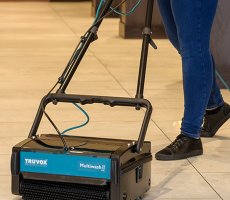 After discussing the nature of the problem, Craig Manson, Sales Director of Cleaning Systems UK, took a Truvox Multiwash scrubber dryer, knowing that the extra pressure exerted by the horizontal contra-rotating brushes of the Multiwash was the best solution available for the problem of grime in the grouting of tiled floors. One demonstration of this fantastic machine was enough. “I simply showed Craig the problem, and he provided me with the solution,” said Brian Dickson. “He could not have been more knowledgeable or helpful”. A vital factor in the decision was the lightness of the Multiwash, which needs to be manoeuvred down some steps in the showroom during the cleaning process. The Truvox Multiwash is one of the smallest and lightest scrubber dryers available. Craig recommended the Multiwash 440/Pump, which as well as having a 44 cm brush width, is fitted with a 4-litre solution tank and a spray pump so that difficult areas can be treated with extra cleaning power. One of four models, the key to the effectiveness and efficiency of the Multiwash range are the two contra-rotating cylindrical brushes. Due to the high brush pressure, the bristles safely dig deep into porous tiles and grout lines loosening and removing soils. As the brushes are so effective, it uses about 30 percent less water - which usually means less chemical as well - making it easy on the environment and the user. In addition, using less water means floors are dry in minutes, making the machine perfect for busy facilities. Craig then arranged full training of three members of Murray Rolls-Royce’s staff to ensure full productivity from the Multiwash. “I am extremely happy with both the Multiwash machine and the service that Cleaning Systems UK provided,” said Brian Dickson. “Our showroom now provides the perfect environment for the finest cars in the world”.